Home / Blogs / superadmin's blog / Generic TV Lamps Sold As "Originals"
Generic TV Lamps Sold As "Originals"
We've been seeing this more and more recently. A customer will bring a Mitsubishi DLP TV into the shop or have us go out to check their DLP TV in their home. We find the problem is they are using a generic lamp. 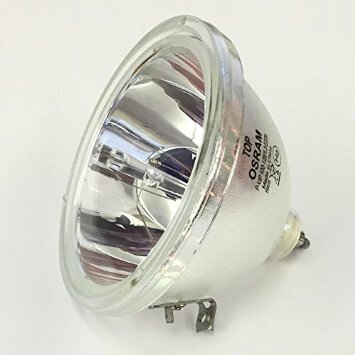 We install a new ORIGINAL OSRAM lamp and the picture is just like new. TV shops around town are selling generic $20-$30 lamps at the price we sell the originals. They are ruining their reputations and wasting customer's time and money. I'm writing this article because a frustrated customer came into the shop today after having spoken with us on the phone. He and his wife had been going back and forth for weeks with a shop off Bandera who sold them a "new original" lamp for $99. The lamp worked for an hour then went out. They took the lamp back to that shop and they tested it for them and told them it's working. They took it back home and it didn't work. The shop asked them to take the TV into the shop. They dropped it off and got a call back the next day saying the LAMP BALLAST was defective and would cost them $300 to get changed. We don't like to see people having such a hard time just to get their TV working. We told him that if he brought it into the shop we'd check it for free. He quickly picked it up from that other TV shop and brought it in. We took out the lamp they sold him to confirm it was a generic. We installed the new ORIGINAL lamp and it fired right up with a great picture. We asked him to leave it in the shop to run a few hours just to be sure. It ran all day with no problem and he's scheduled to pick it up tomorrow. We sell the NEW ORIGINAL LAMP for $10 LESS than the other guys sell a generic that you can get on AMAZON for $20. They have the right to sell cheap generic lamps. The DON'T have the right to sell them and claim they are the original TV lamps. That lack of ethics is all too common in the TV lamp business. We hope you will get it done right the first time. If you don't buy from us at least get your TV lamp direct from the manufacturer. You'll save yourself time, money, headaches, and your TV will look better and last longer.